Whether you’re chatting with someone at a car show or reading about vintage automobiles, you’re bound to frequently run across some common terms, such as CID, VIN, and OEM; read on for a brief glimpse at the meaning of these common automotive terms. CID stands for cubic inch displacement, and at its core, it speaks to the power a car’s engine creates by displacing air. The displaced air is measured in cubic inches. 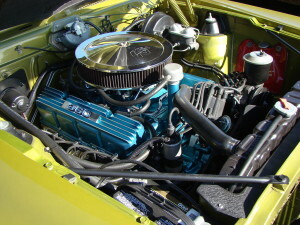 Powerful engines, such as those in muscle cars, have higher CIDs than engines with less power, such as compact cars. Frame-Off restoration means the entire car is taken apart and then each piece is cleaned, replaced, or repaired to put the vehicle back to its original state, just as it would have been when it rolled off the assembly line. Matching numbers refers a vehicle’s VIN number. VIN numbers of cars are marked on the engine, transmission, and chassis – with the same number in each location. If a car’s engine or transmission is replaced, or the chassis, then the numbers will no longer match, and non-matching numbers can affect a vintage vehicle’s value. OEM means original equipment manufacturer. Using OEM parts for a classic car restoration project helps ensure the quality of the parts going on the vehicle, and in comparison to knock-off parts, it help maintain the car’s value. VIN is the acronym for Vehicle Identification Number, and it contains encoded information about the vehicle in addition to the vehicle’s serial number. When you read the VIN, you can use the encoded data to confirm the year the car was manufactured, its model number, and basic information about the car. Check back soon to pick up ‘plain language’ definitions of some more common automotive terms – and if you’re looking for a specific term, feel free to leave a note in the comments section so I can make sure it’s covered right away.